Mrs. Labrini Pappas’ only daughter, Penelope, has worked for Cournale & Co. since high school. This local real estate company has upheld a wonderful tradition for years -- every month, an employee is randomly selected to designate a charity to which the Cournale& Co will make a donation. When Penelope’s turn came up, she chose the St. Mary’s Foundation. Foundation staff called her to say thank you and ask why she had chosen us for this thoughtful gesture. Penelope’s mother, Mrs. Pappas was always an active, independent woman. She enjoyed keeping her home clean too. So clean, in fact, it was not uncommon to find her dusting while standing on the furniture… On one occasion, perched on her kitchen table to reach a corner of the ceiling, Mrs. Pappas slipped and fell. Falling forward; her head and neck collided with the very spot where the wall meets the floor at an impossible angle that resulted in a severe spinal injury. Rushed to San Francisco General Hospital for preliminary care that stabilized her condition, Mrs. Pappas’ family sought out follow up rehabilitative care. Penelope remembers how the family had to prepare for her mother’s restricted mobility. The exact diagnosis was a hyperextension fracture of the cervical spine vertebrae C-4, with incomplete quadriplegia. While seeking post trauma care for Mrs. Pappas, one facility told Penelope, son-in-law, and her two toddler grandchildren what could be their new normal. 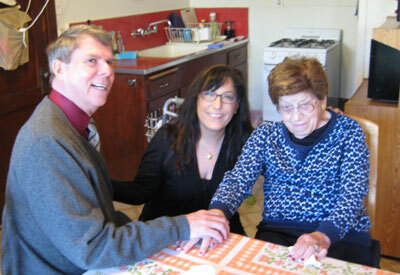 Mrs. Pappas would be confined to a wheelchair or worse; bedridden, unable to feed, dress or care for herself. 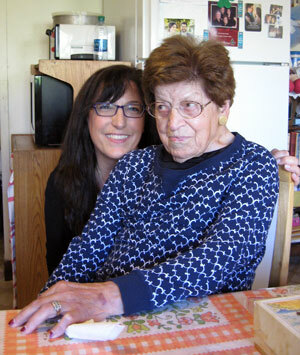 Penelope could not accept the harsh diagnosis, nor the suggestion that her mother would be confined for the rest of her days to a nursing home. After all her mother was only 69! Determined to find other options, Penelope received a referral to St. Mary’s Medical Center, where Dr. Stanley Yarnell examined Mrs. Pappas. He was confident he could restore her quality of life, and get her back on her feet. With that news, Mrs. Pappas came to St. Mary’s where Dr. Yarnell evaluated her condition, and coordinated her intensive physical therapy to restore balance in her legs and core. Because the muscles in her shoulders, shoulder blades, and arms were terribly weakened by the injuries from the fall, occupational therapy helped her regain muscle, as well as use and mobility of her arms and hands. Dr. Yarnell and St. Mary’s Medical Center put a tremendous value not only on Mrs. Pappas’ recovery, but also to help the entire family recover and collectively improve Mrs. Pappas’ future capabilities. In that spirit, a psychologist was assigned to help the patient cope with her life changes, and a case manager was assigned to the entire family so they could all support each other through recovery and rehabilitation. Well, here we are, more than 20 years Since being discharged from St. Mary’s, Mrs. Pappas has lived independently and thrived. She lives in the same home, and eats at the very same table she fell from those many years before. Mrs. Pappas still loves to bake – and for her reunion with Dr. Yarnell, made him the very same cookies during their visits as doctor and patient. She has made two trips back and, still enjoys a vibrant life with her friends and family. Penelope remembers and is so very grateful to Dr. Yarnell, the PT, OT, psychologist and case worker who gave her mother a healthy life after such an injury. Mrs. Pappas is coming up on her 92nd birthday in March, and is an active participant of all the weddings, birthdays, and holiday celebrations with her family.